Hello? Hello? Is your radio on? | Damian Trasler's Secret Blog - Do Not Read! Hello? Hello? Is your radio on? It’s not often I’m contacted by the media, but a week or so ago, I did get a call. CBC Radio had seen an article about my juggling workshops in the paper and wanted to talk to me about them. Ten minutes later, they decided that, no, they actually wanted to talk to me about me, and the strange life I’ve lead. Fair enough, I thought. The call was from CBC’s North by Northwest, a magazine programme that runs on the weekend. They interview a variety of people for a variety of reasons, and now it was my turn to talk about life, emigration and playwriting. It was a Sunday morning recording session, and I made my way to the studio on the skytrain, enjoying the various landmarks that loomed out of the fog. 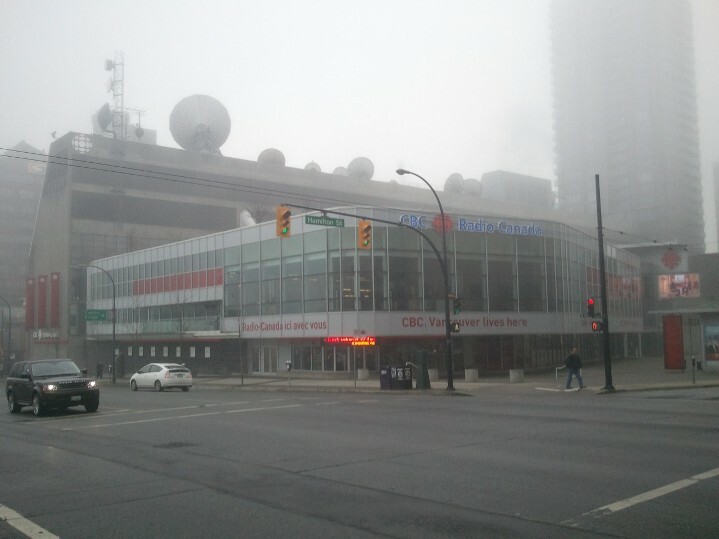 I was met in the lobby of CBC by my hostess, Sheryl MacKay. She took me through to the studio where we’d be chatting and got me a drink while I tried to relax and stop worrying about saying something really stupid. At least this was going to be recorded and edited before broadcast! Sheryl was very calming, and I found it easy to talk to her. I wanted to mention the brilliant work SMP Dramatic Society had done with the TLC pantomime “Knight Fever” , which I’d seen with my family just the day before, and I wanted to mention TLC in general, and the appraisal service I run. Oh, and there was my collection of e-books, and the one I haven’t finished yet but which SHOULD be out at the end of the month, and…oh, we’re out of time? I think I kept my head and was interesting, rather than insane. Life has been, as you’ll know from previous entries, a serious of bizarre events and co-incidences and lucky breaks. Mrs Dim says we’re blessed, and looking around at the Weasels and my plays and the friends we have now, it’s hard to argue. So, if you’re at a loose end this weekend, why not tune in to CBC and listen out for North By Northwest? I haven’t found out exactly when I’m being featured, but it’s quality programming, so you should enjoy it anyway. This entry was posted in Uncategorized, Writing and tagged CBC, Damian Trasler, interview, North by Northwest, plays, radio, Sheryl MacKay, writing. Bookmark the permalink.